Dharamshala Tours & Travels - Service Provider of art and kangra hill crafts, ancient hand embroidery & stitches of kangra valley in Dharamsala, Himachal Pradesh. 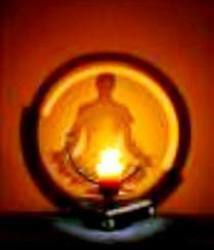 The first beginning for any buddhist artist is the 'realisation' of Buddha's spirituality.It is then the artist discovers the need to canvass this enlightenment of his heart and soul into 'creative art'. Buddhism came to Tibet in the 07th century AD from India and the various cosmic 'Buddhas' like Shakyamuni Buddha, splendid Female and Male 'Bodhisattvas', all became the essential soul of this Ancient Art ! 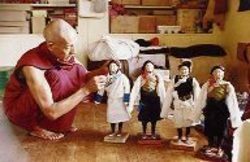 Surviving Tibetan culture dating from the 09th century AD, presents a wealth of magnificent Monastery Wall Paintings, Thangka Paintings, Wood and Applique Crafts,Losel Doll-making, Sculpture and Statue-making along with Tibetan Dance, Music and 'Lhamo Opera'. Exquisite hand embroidery is a designer's delight in Tibetan art and Kangra motifs. The wooing 'Raj-Hans' birds in the season of spring is beautifully exhibited in the 'Bharai' works of Hand embroideries in this Valley. The above, 55 years old Bharai motif decorates the walls of 'Kotha Basant' room of Himalayan home - Vidya Niwas in Dharamsala. 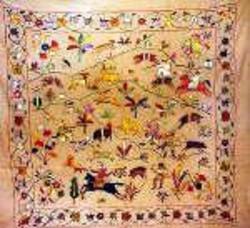 The 'Chamba Rumal'- The Friendship Handkerchief is a rare delicate piece of handwork in Himachal Pradesh. 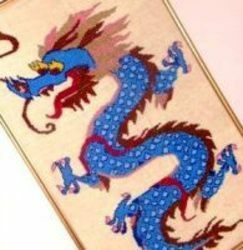 Traditional Tibet art motif of the 'Fire Dragon' embroidered in Kangra Cross-Stitch work, adorns the walls of 'The Golok Princess' room of 'Vidya Niwas.' Hand embroidery of various kinds is an important part of Himachali culture!